"Jerk chicken teams up with ghost pepper cheese and barbeque sauce to give this Caribbean pizza maximum heat and flavor. Top it with mango salsa for a cool finishing touch. Recipe by Chef Thomas Catherall, C.M.C." To Prepare Toppings: Coat chicken with jerk seasoning. Heat olive oil in saute pan; sear chicken for 2 to 3 minutes on each side. Remove chicken from pan, add mushrooms to pan, and saute them for about 1 minute. Drain liquid from pan. Slice chicken into thin strips. To Assemble Pizza: Spoon barbeque sauce over pizza crust. Top with mushrooms and chicken strips. Sprinkle cheese on top. 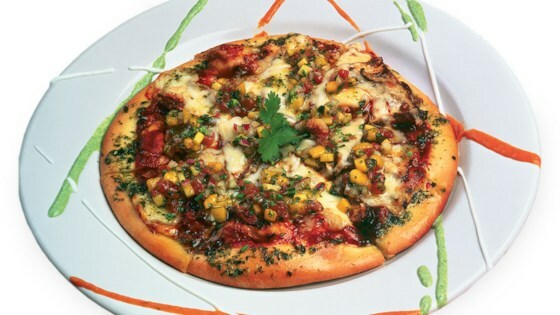 Bake pizza for 7 to 8 minutes until crust is browned and cheese is golden and bubbly. To Prepare Salsa: In small mixing bowl, combine and thoroughly mix all ingredients. Garnish pizza with mango salsa immediately. For the salsa, you can use fresh mint, basil, or cilantro or mixture of all three.